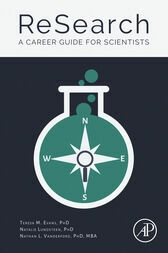 ReSearch: A Career Guide for Scientists is a career planning guide and practical tool for graduate students and postdocs. This book provides step-by-step processes for the assessment of career goals and the actions that can be taken in order to achieve them. ReSearch includes chapters on the basics of career planning, determining unique selling points, and navigating work-life concerns. This book also includes narratives from a number of perspectives to showcase the variety of career options available. ReSearch is written by experts with inside knowledge of how to effectively leverage skills in order to take that next step in your career, whether you are a recent graduate or are interested in transitioning into something new. This book is also a valuable resource for advisors and careers counselors who mentor students and postdocs about their career plans.